I have written quite exhaustively about onigiri, or rice balls, here on Just Bento as well as on Just Hungry . Many people have asked similar questions about onigiri, which seem to just be gaining and gaining in popularity these days. So I’ve assembled a list of Onigiri FAQs (Frequently Asked Questions). I’ll update this list when I see (or remember) other questions periodically. What is an onigiri? An onigiri is a savory (salty) compressed ball of rice. It often has a filling or a coating of something savory, but there are also onigiri made of pre-flavored/mixed rice, as well as plain rice onigiri simply made with salt. My Japanese friend/my Japanese grandmother/my Hawaiian uncle calls it something else… Onigiri are also often called omusubi （おむすび）. Some more obscure regional names include nigirimama and oninko. You can also drop the honorific  o and call it musubi, nigiri, or nigirimeshi (which literally means “hand-pressed rice”. What you call it just depends on where you grew up! In Hawaii, a rice ball is called a musubi mostly. There was a big wave of emigration from Japan to Hawaii in the late 19th century, mainly from the western/southern parts of the country, which probably accounts for the use of musubi. Are onigiri just for bentos? In Japan, onigiri is a basic convenience food. People carry them on hikes, car trips, have them for breakfast, as late night snacks…etc. Is Spam Musubi Japanese? Spam musubi is a product of Hawai; it was probably created by immigrants of Japanese descent. Spam was virtually unknown until fairly recently in much of mainland Japan. (Spam is fairly popular in Okinawa, which was occupied until the 1970s by the United States and still has a U.S. military base. It’s also very popular in South Korea. Both regions, as far as I can find out, got their Spam habit from Americans.) Personally, I just can’t make myself like Spam in any form, so you won’t see any spam musubi recipes on this site - sorry! There are plenty of spam musubi recipes online however - see this one on Lunch In A Box , or this step by step on Cooking Cute . How many calories are in an onigiri? It depends on how big it is or how much rice is used to make it. 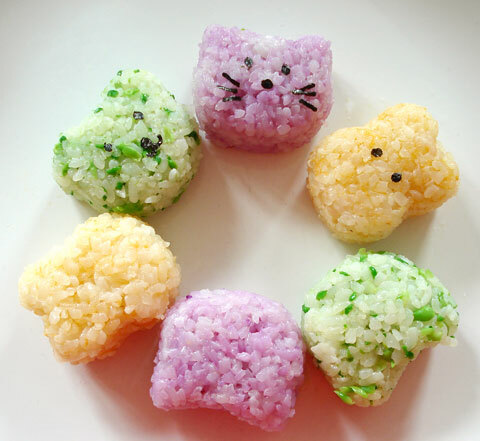 A typical onigiri has about 1/2 cup of rice, so it’s around 100 calories plus whatever is used for the filling. Does an onigiri have to be made with white rice? You can also make it with brown rice, as long as it’s medium-grain Japonica rice or short-grain glutionous rice. See Looking at rice . Are onigiri diet food? Well, that depends on how big they are! Many people find onigiri more filling than sandwiches, but that’s a subjective thing of course. What’s the key to making good onigiri? The base ingredient of onigiri is the correct type of rice, cooked properly. A rice cooker can be very helpful for doing this. See how to wash and cook rice properly  using a rice cooker or on the stove, and more about rice cookers . Do I have to use Japanese rice? What about jasmine rice (or other types of rice)? An onigiri has to stay in a ball shape, so the rice has to be glutinous enough that the grains stick together. That means that long grain rice types like jasmine and basmati are not, I repeat not, suited to onigiri. (I feel very strongly about this.) Sure, mushy, overcooked rice will glue together if you mash it hard enough, but it will not taste nice at all. The most suitable types of rice for onigiri are medium grain or short grain. See Looking at rice  for different types of rice. If you can’t get Japanese type rice (or ‘sushi’ rice) easily where you live, Italian rices used for risotto can be substituted. How do I make onigiri? There are very detailed instructions for how to make them with your bare hands , plus an easier way using plastic wrap . JustBento reader Samantha contributed this great method of making onigiri in a plastic bag , using the corners! You can also use handy molds/moulds: Cooking Cute has a nice step by step  tutorial. 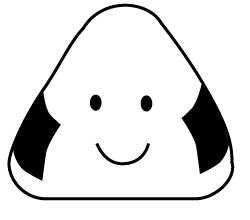 Recent onigiri molds come in a handy scooper shape which makes making onigiri in all kinds of cute shapes even easier. Example: these Hello Kitty molds , and the colorful mini onigiri I made with them . Does an onigiri have to have a filling? No it doesn’t! The most basic type of onigiri is a shio musubi (塩むすび）, a plain rice onigiri with salt on the outside. This is the kind of onigiri that was carried around in feudal times by samurai and foot soldiers on the warpath. It’s a great way to enjoy simple, well cooked good rice. What are traditional onigiri fillings? A list and photos of the most common traditional fillings are on the Onigiri on Parade  page. The top three traditional fillings are: umeboshi (pickled plums), shake (salted salmon - how to make your own from fresh salmon ) and okaka (katsuobushi or bonito flakes flavored with soy sauce). Non-traditional fillings? Anything you can imagine! Some suggestions that readers have made in the past include: chopped up olives, anchovies, pickles, a small meatball, cooked chicken, sausage meat, chopped up Spam, corned beef… as long as it’s not too wet, compact and a bit salty, anything can be a good onigiri filling. Help! My onigiri fall apart! This could either be due to using the wrong kind of rice (long grain rice, jasmine rice, basmati rice, etc. are not sticky enough to make a rice ball with), improper cooking of rice (it should not be too dry/hard OR too sticky/gluey) or using a filling that’s so oily or watery that the oil/water seeps out into the rice, making it fall apart. Do onigiri have to be wrapped in nori seaweed? No they don’t, though a wrapping does help to keep the rice together. Again see Onigiri on parade . If you want to go wrapping-less but your onigiri falls apart before you can eat it, try transporting them wrapped in plastic wrap. You can even buy special cute onigiri wrapping film ! I hate nori…alternative wrappers? A popular wrapper is salted fresh shiso leaves . (I must confess that when I was a kid, I hated nori! But now as an adult I love it, so it is quite possibly an acquired taste.) Other wrappers include tororo kombu (a thin, salty form of kombu seaweed) and usuyaki tamago  (thin omelettes). Can I freeze onigiri, and if so how? Yes onigiri can be frozen very successfully. Just wrap them individually in plastic wrap (cling film), and then in a freezer box or bag to protect it from freezer burn. You can defrost the onigiri in the refrigerator gradually, at room temperature, or zap it in the microwave. See Keeping onigiri fresh and more  Don’t keep frozen onigiri in the freezer for too long, or they will eventually get freezer burn. How do I prevent onigiri from getting dried out? Keep them well covered/wrapped up. How long do onigiri last in the refrigerator? How do you keep them safe to eat? This mainly depends on the filling as well as how much salt you use on the surface when you make the onigiri. If you use tuna with mayonnaise or any filling with mayonnaise in it, do not keep more than a day to be safe. If you use traditional fillings, especially umeboshi (pickled salty plums) they will last a lot longer, but no more than a couple of days. Umeboshi has natural antibacterial qualities, so is the ideal filling for onigiri that have to be held for some time - say, made the evening before to be eating or lunch on the road the next day. In any case, you should make onigiri with adequate salt on the outside, completely cooked fillings (never ever use raw/uncured fish or rare meat) and always use freshly cooked (ideal) or defrosted/reheated rice. If the weather is very warm and humid and you have used spoilable fillings such as tuna/mayo, consider packing your onigiri with an icepack (see Summer Bento Safety ). You shouldn’t eat onigiri that has been around outside of proper refrigeration for more than a day. Anecdotally, I have eaten onigiri that was a day old (made the morning before and eaten for breakfast) that had been in packed in a paper back and thrown on the back seat of a car, not in a cooler, and survived without any problems (it was in the fall, not midsummer), but you shouldn’t do this regularly! The fillings used that time were umeboshi and salty salmon, for what it’s worth - no tuna-mayo or crab salad or other highly perishable filling. Can I use sweet fillings for onigiri? Fundamentally you can use anything you like - it’s your food! However, in Japan if you make a ball of rice (which is often sweetened itself, and pounded partly or fully to a sticky paste or dough) and filled with something sweet it becomes confectionery or wagashi . Some wagashi that take the rice-with-sweet-filling form include daifuku, mochi of various kinds, yatsuhashi  and so on. The wagashi that’s closest to the idea of a sweet onigiri is probably ohagi or botamochi , glutinous rice “onigiri” of sorts which are filled, covered or both with sweet bean paste, kinako (toasted soy bean powder), sesame seeds and so on. So, to Japanese sensibilities an onigiri is something savory, not sweet. What’s the difference between sushi and onigiri? Again it’s a matter of how things are normally categorized in Japanese cooking, but generally speaking anything made with vinegar flavored rice, or sushi rice (sushi meshi or shari) iis sushi. So you could make an onigiri-shaped item with shari, and call it an onigiri, but if a Japanese person ate it s/he would probably think it’s sushi in an onigiri shape. Nigiri-zushi, the best known sushi shape with a little ball of rice topped with fish or something else, is sushi that has been shaped with the hands (nigiru) - the same word that forms part of the word onigiri. How to make onigiri with plastic wrap  - easier for beginners! Onigiri in the movies  - two Japanese movies that feature onigiri prominently (Supermarket Woman and Kamome Diner). By the way, in Kamome Diner there is a scene where the owner of the Kamome Diner (a small Japanese cafe-restaurant she opens in Helsinki of all places) and her new friends are testing out alternative fillings for onigiri that they think may be more to the taste of Finnish people. They test things like crayfish, reindeer meat, pickled herring, and so on. But ultimately they come to the conclusion that the best fillings are the classics, the Big Three traditional fillings mentioned above: umeboshi, shake and okaka. I have to say I tend to agree with this (though I might add grilled tarako to the list too)!